Long before there were houses, long before the trees that made the houses, long before the roads and highways, long before a country called America, there was this river. Our river. Flowing from Lake Tear of the Clouds in the Adirondacks 315 miles southward to the Atlantic, flooding tidal marshes and mudflats and carving basalt palisades as it widens. 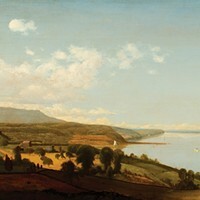 The Hudson, quite simply, is lifeblood to this valley. The river and intricate net of waterways that feed it, are habitat not just for humans, but for sturgeon, cormorants, ospreys, otters, bald eagles, and all the other myriad wildlife that harmonize, cacophonize, and make this ecosystem home. 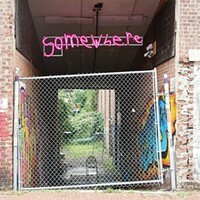 It is also the current address of Emily Cichon. A sailor and shipwright, Cichon lives aboard the Sea Lion, her 31-foot sailboat, anchored, most nights, on the Rondout Creek in Kingston. 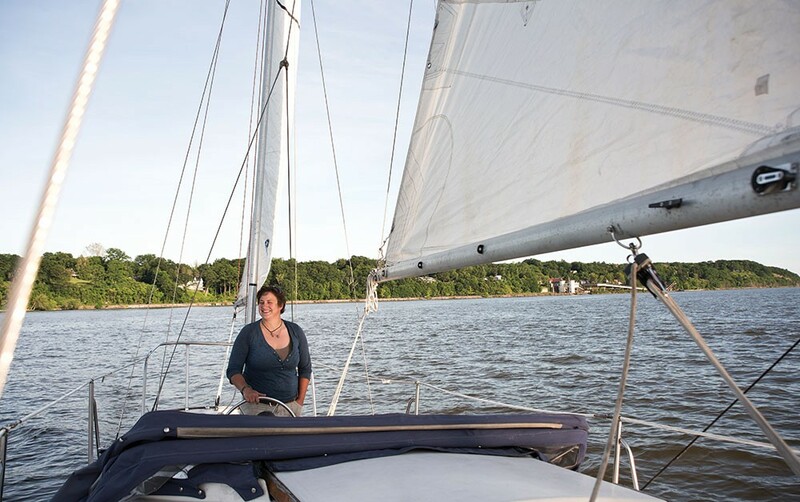 Her passion for sailing brought her to the Hudson Valley, and now is giving her the opportunity to learn about the river—its terrain and its traditions—intimately. "She's a really great, solid boat," says Cichon of the Sea Lion. (Sailors, she tells me, tend to be superstitious and also refer to their boats as "she.") Seven feet wide at its broadest, her tiny traveling house may have less than 400 square feet of living space above and below deck, but it's enough to traverse an ocean. The decor is simple. A compact kitchen, located in the starboard midsection, has an icebox, sink, and an alcohol-fueled stove all underneath a hanging net full of simple provisions. Portside midsection, there is a padded bench along a wall of hideaway cubbies spilling charts, batteries, navigational plotters, postcards, and other accouterments of nautical life. Past a tiny bathroom, a triangular sleeping berth covered with a thick, red-and-yellow-striped blanket fills the space under the bow. However nothing—not the cabin wall with ship to shore radio and GPS, or the extra yardage of rope and rolled canvas stowed in the corners, or the 2016 calendar fixed on the bathroom door depicting the slowly rotating constellations of the night's sky—detracts from the view. Along the top edge of the cabin, a row of rectangular deadlights (windows that don't open) flood the interior with light and frame the ever-changing horizon. Above board, there is seating for four people around the wheel and compass, and additional deck space over the bow. On top of that sits the Sea Lion's "rig"—the set of sails that Cichon expertly wields to regularly take herself out onto the river. The Sea Lion has three sails—a smaller mizzen over the back, a large main sail over the center, and a jib in front. When unfurled, they easily triple the stature of the sailboat (known technically as a yawl) and draw all attention upward and outward. Filled with wind, the sails jump to life. With the blue-and-white jib sweeping across the bow and the Sea Lion pitching into the Hudson River tide, I finally understand why Cichon talks about the Sea Lion as if the boat were listening: She is. People have been crafting boats to explore the Hudson and the adjacent Atlantic Coast almost as long as they've been living beside it. Cichon came by these traditions early. Born and raised in Groton, Connecticut, she was taught to sail by her parents and at 14 Cichon was hired as a deckhand on the 81-foot schooner Argia. It was the influence of her fellow sailors, and particularly the Argia's captain, Paige Marolda, who served as role models for Cichon and sparked her passion. "[Marolda] had this charisma," remembers Cichon. "I wanted to be just like her." The camaraderie of her fellow sailors also boosted Cichon's confidence. "They showed me that I could do anything: I could sail an 80-foot boat, I could be a woodworker. It took a village to raise me, and they taught me to be strong." Cichon also took to the long days working on the water and the variety of people who would come aboard. She spent her summers on the Argia, helping with daysails and its environmental education program. After graduating high school, Cichon decided to pursue sailing as a serious venture. "The more I did it, the more I enjoyed it," she says. "Then I realized I was pretty good at it, too." Cichon's experiences led her to a job as second mate on the Clearwater. Beginning in 2013, she worked, lived, and slept aboard the Clearwater as it spent summers educating passengers about the beauty, history, and ecology of the waterway. Learning to sail the river tested her navigational skills and expanded her sailing knowledge. "There's so much movement of water here—it can create shoals that weren't there the summer before," she explains, showing me a map of the Hudson with names like Hogs Back and Saddle Bags demarcating underwater terrain Valley residents regularly glide over on a bridge. Her experience on the traditional wooden sloop also gave her an appreciation for the effect a boat like the Clearwater could have on the surrounding community. "When I first started working on the boat and had a day off," she explains, "I went to an ice cream parlor in Schoharie County. I was chatting to the server, who told me he had been on the Clearwater in fifth grade and what an impression it had made on him. We were an hour inland. It is really special how the Clearwater helps people become cognizant of the river again." Cichon was so inspired, she decided to add shipbuilding to her resume. She now has an enviable commute: Just along the Rondout Creek, within walking distance from the Sea Lion's slip, is the Hudson Maritime Museum, where she is learning the craft of traditional wooden boat building. Her first project was helping with the Clearwater's stern restoration. 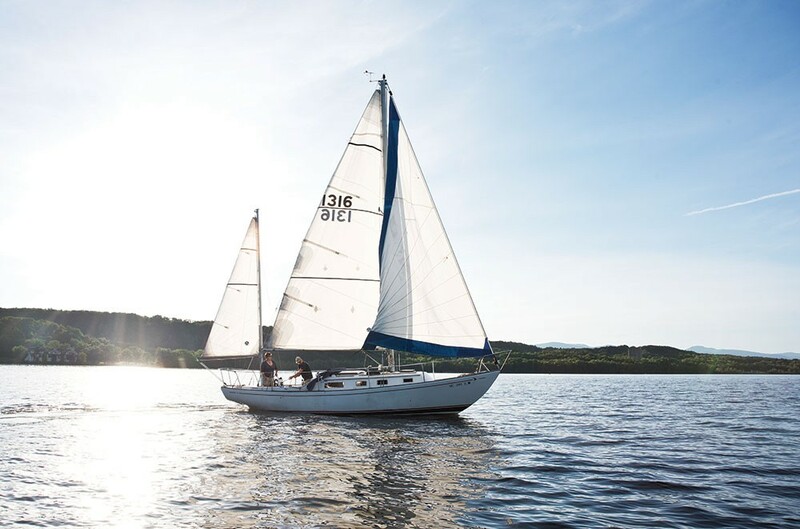 After that, she began her contract to help restore the Woodie Guthrie—another sloop, smaller than the Clearwater but inspired by Pete Seeger's same grand vision of impressing the beauty and tradition of the Hudson on its passengers. It was just a natural step, to apply that knowledge to her own living arrangement. 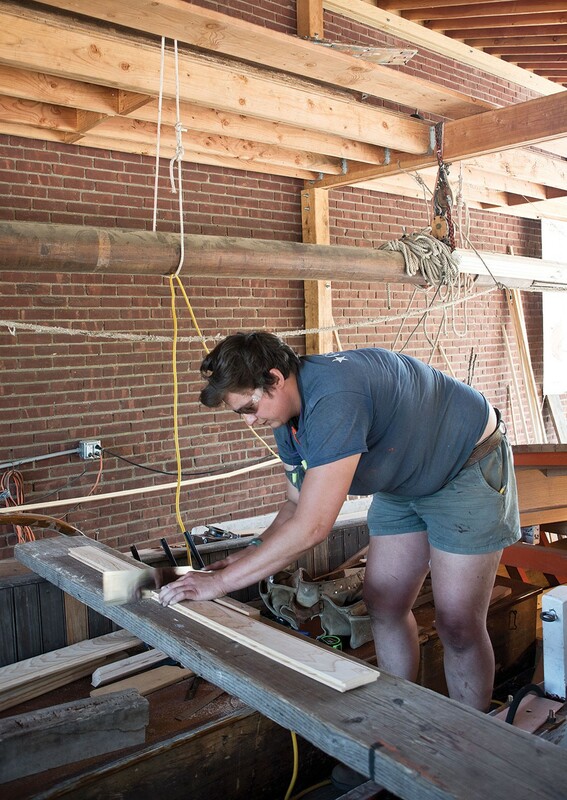 Cichon is currently crafting new wooden frames for the boat's deadlights during her "off" hours at the Museum. Her coworkers, expert builder Jim Cricker and his team of seasoned shipwrights, have been a great resource. "Collectively they have so much knowledge," she says. "I have a great support group here." This will all come in handy for her next plan: When her contract with the Woodie Guthrie is done, Cichon hopes to unfurl the Sea Lion's sails, catch a favorable wind, and then sail southward, down the Atlantic coast to the Bahamas. Another thing sailing the Hudson has taught Cichon is the importance of timing. "With the river, you don't want to fight the current; wait for the fair tide, then go," Cichon explains. "A boat is meant to be sailed."